The neat thing about the net label Clinical Archives is that I never know quite what I am going to hear. After all, who would have thought that mixed in with all the avant-garde, electronica, and experimental music would be this very down-home country EP that reeks of dogwood, cicadas and Hank Williams. Live Candy gives us a very live and very authentic country honky-tonk experience that defines the terms “Alt-country” and “Americana”. Keith Morris with his back-up band The Crooked Numbers is the real thing. This is evidenced from the first track, “Snowday” which immediately hooked me on the plaintive and somewhat nasal voice of Morris. The instrumental and vocal backing is especially nice. Morris has no problems sharing vocals with Devon Sproule on “Billie Weir’s Dress” and Jen Morris on “Waltzing”. 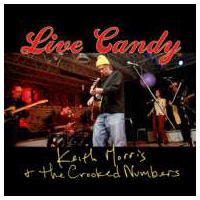 The songs are all Morris originals and all tracks but “Candy Apples” are performed live. The non-live track is a March Rosetta re-mix which is more pop oriented than the rest of the EP but it is still a delight. Alt-country fans need to grab this up quick.